CT Safety Barriers Ltd began life as a small manufacturer of safety barrier and warehouse protection products. From those humble beginnings we have grown into one of the leading manufacturers and suppliers of safety products including armco barriers, crash barriers, handrails, bollards and warehouse protection systems in the UK. At our purpose built manufacturing facility situated on the motorway network in Yorkshire we supply our products anywhere within the UK and Europe. Our knowledge and skills are augmented by a strong emphasis on performance, quality, teamwork and a “hands-on” management approach. We listen to our customer needs and our aim is always to deliver the most cost-effective, highest quality solution to all projects. Our commitment to ensuring ongoing customer satisfaction is rewarded by the high level of repeat business we receive from our customers, and we like to think our clients enjoy working with CT Safety Barriers because of the friendly, co-operative way we work. We also carry out Installations of all our products if needed by our clients, our installation teams are fully qualified, experienced and knowledgeable in all our products. Our manufacturing facility also carries out all types of general fabrications with the ability to design and manufacture products to you specification, as well as a range of street furniture and site safety products, including telescopic security posts, bollards, steel hoop barriers, palisade and mesh safety fencing systems. CT Safety Barriers is a ISO 9001 quality management and OHSAS 18001 Occupational Health & Safety Registered company. Armco Crash Barriers is the generic name for a steel safety barrier system widely used both inside and outside. The aim of the safety barrier is to keep vehicles within a designated area to protect people, assets and property against injury and damage from the moving vehicle. The versatility of an Armco Barrier allows it to be used as a single or a multiple height barrier, with legs either bolted down or cast in to the ground. The legs can also be adapted to carry an integral handrail for effective pedestrian protection. All Armco barrier products are manufactured to meet BS6399, BS6180:1999 and are galvanised to EN ISO1461. Off road Armco Barrier rails are 3500mm long with an effective length of 3200mm (overlap of 300mm with previous Armco barrier rail), the standard thickness of the barrier rail is 3mm. 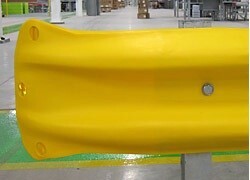 The Barrier rails can also be curved to suit your requirements. 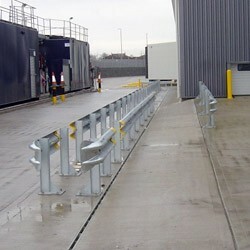 At CT Safety Barriers we also provide a cutting service allowing exact sizing of barrier runs. Posts for Armco Barriers are available in RSJ, spring steel and Z-section profile, and can be both bolted down or cast into the ground. The type of posts and their centres can be altered, dependent on the type of protection you require from your Armco Barrier System, typically the leg centres on Armco barrier are at 3.2mts, 1.6mts or 0.8mts. Armco Barriers are usually finished off with a terminal end; the most common type of terminal for a barrier is the Fishtail end (Type A). However if the ends need to be Pedestrian friendly Pedestrian Ends or Plastic End Caps can be fitted to the Armco barrier. At CT Safety Barriers Ltd we have now introduced a new range of rubber and Polymer terminal ends, We now have Rubber Armco barrier ends as well as Polymer fishtail and Pedestrian ends. Armco Barriers can be sent in different directions by the use of Armco Corners, corners are available in 90 & 45 degrees. However if you need your Armco barrier to go in a different angle the use of flexible corners are used. Armco Barrier corners are available in both internal and external formats. we also offer Plastic end caps for posts. 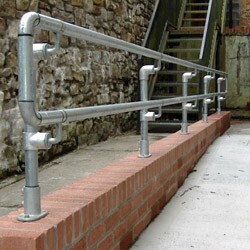 CT Safety Barriers Ltd offer a wide range of cost effective Safety handrail barrier systems, from the malleable clamp fitting system for easy installation available as standard and for DDA compliant handrails. We also manufacture edge protection systems, ball type standards and fully welded handrail systems in mild steel and stainless steel. CT Safety Barriers Ltd provide a versatile range of malleable iron galvanised slip-on pipe/tube fittings, made to BS EN 1562:1997. These fittings are quick and easy to use with the use of a simple hexagon key. Typical clamp applications are steel handrail, safety guardrails, fencing, playground equipment, racking, sports practice nets, greenhouses, exhibition stands, roof top fall prevention, pedestrian barriers and wheelchair access ramps. The Clamp system can also be Powder Coated to any RAL colour you require. The DDA range has been specially designed to help comply with the Disability Discrimination Act (DDA) and the Building Regulations Part M: 2004. Both Internal expanding and saddle type fittings are available. The DDA fittings are designed to be fully integrated with both new handrail systems and the refurbishment or upgrading of existing tubular structures to help meet the newer access specifications. Roof Edge Protection is a counterbalanced handrail system designed for safe working at height, and has been designed in accordance with BS EN 13374:5004 as a class A protection system. The barrier can be assembled to provide a guarded walkway across a roof as well as a roof edge guard. The Protection has Rubber membranes on all surfaces in contact with the roof to maximise friction without damaging the roof surface. The Tube & Ball Handrail is suitable for installations in almost every type of application from stairways, walkways and platforms. They provide high performance safety and protection in different environments particularly in circumstances where there is moving equipment or machinery present. Static Bollards can be used in both Industrial and Commercial environments and can be bolted down or cast in to the ground. Made to your specification and come in many different sizes and thickness, and can be Galvanised, Powder Coated to any RAL colour or both. All our posts can also be adapted to carry chain hooks. We manufacture a range of high quality bollards and barriers in stainless steel, these come in a variety of sizes and lengths, the most common being 90/101/114/129/154/204 but other options are available. Top profiles are either flat, semi dome or mitre, with milled grooves and hazard bands possible on many sizes. Mostly brush satin finish in either grade 304 or 316, mirror polish is also available and options for bolt down or removable can be offered. These bollards can be strengthened with a mild steel primed insert for anti-ram. Carbinox is the next evolution for today’s market looking for high quality finish, strength and value. 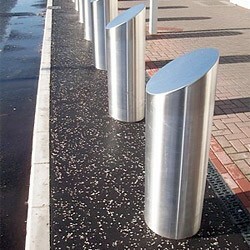 With this material we have developed the Strata range of bollards. In this instance the process has been developed to allow .5mm of stainless steel to be overlaid onto a 4.5mm mild steel core to create a single material we can manufacture anti-ram bollards from. Available in flat, mitre or semi-dome format, diameters for the bollards come in 90/102/114/130 and 168 variants.